But ESPN is relentless with coverage of the Razorbacks' embarrassment. All the talking heads are droning on with their theories on why the Razorbacks lost to a vastly inferior opponent. For the initiated Lone Star Hog however, the answer is obvious. The reason the Razorbacks lost to Toledo is because we were playing a Home game away from home, and no one can convince us otherwise. Little Rock has many charms, but a world class football venue is not among them. ^On the rare occasion War Memorial does sell out, it only holds that many because fans are packed in like a Whataburger drive-thru line. The staff are very friendly, but always overwhelmed by the sheer scale of a Razorback game. The restrooms are akin to those at a dodgy horse track. Crowd involvement is less than stellar. There are issues at play concerning games in Little Rock that run to the confusing core of state politics and influence- but Lone Star Hogs aren’t very concerned with such things. We want to see our beloved team win, so let’s play where we have best chance to: Fayetteville. I reckon all the wins we have taken away at War Memorial should be blamed on the location as well? I have been a fan my entire life I have been to War Memorial 12 times to watch my Hogs play I have also been to fayetville numerous times I have whit eased triumph and defeat at EACH stadium. Why wouldn’t you call WMS (War Memorial Stadium) a home game? 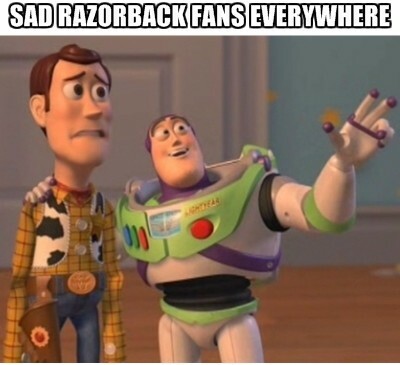 Have you ever met Arkansas fans. We have been voted the most vast and feared fans several times. A hog call with 30 seconds remaining and the visiting team on a series to try and capture the win will melt knees and send an EERIE feeling down the spine of the opposing quarterback. Just ask Tim Tebow who has faced this haggling task he admitted that it was the scardest he had ever been hearing an entire stadium packed to full capacity with each and every one of them chanting WOOOOOOOO PIGGG SOOOOOIIEEEEE and guess where that game was held. You’re right. WAR MEMORIAL STADIUM!!!! Are you rabbit assed crazy? They lost because they weren’t ready to play . Little Rock had nothing to do with it. I suppose Little Rock wasn’t the reason for our big wins there. Imbeciles.